One of the appalling aspects of the PNG solution—and the entire Pacific Solution—is the way the Labor government has coerced poor, small Pacific countries to be complicit with Australia’s human rights abuses. It reveals how Australia’s military and economic power dominates the region, and PNG in particular. PNG has been able to extract some concessions from Australia because of the Labor government’s desperation to have a political fix for the election. Indeed there are suggestions that PNG approached Australia. 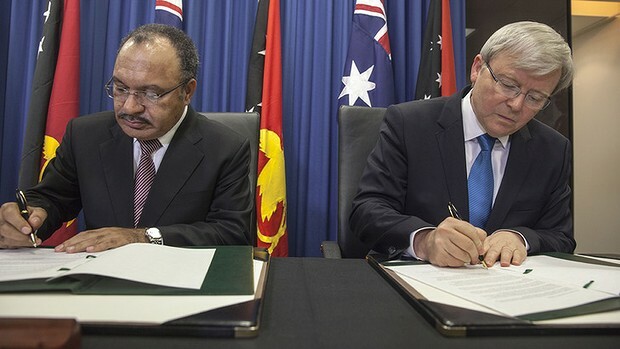 PNG’s Prime Minister Peter O’Neill has boasted that Australia has agreed to give PNG control over the foreign aid money given to PNG. According to O’Neill, Australia is also spending hundreds of millions of dollars for roads, universities, navy bases and other unspecified projects. However this obscures the fact that despite winning formal independence from Australia in 1975, Australia still treats PNG as a neo-colony. O’Neill was backed by Australia when he came to power in 2011 in a constitutional coup. PNG is the largest recipient of Australia’s foreign aid—totalling $500.7 million in 2011-12. In 2012, Australian investment in PNG was valued at $18.6 billion, only $1 billion less than the value of Australian investment in China. Australia is PNG’s largest trading partner, and PNG exports fives times more to Australia than China. Most of the Australian investments are in resources, particularly gold mining and oil and gas. A mining boom has seen the PNG economy grow an average rate of 6 per cent over the last 10 years. Australian companies have made billions. Yet, according to the World Bank, PNG poverty levels “have not changed significantly over the last 15 years”. In the capital, Port Moresby, poverty has actually risen. Over 37 per cent of the total population lives below the poverty line. Australia also maintains strong military links with PNG and has directly intervened from time to time, such as in the Bougainville independence struggle, to back the PNG government and defend Australian mining interests. In May this year, Julia Gillard negotiated a “Joint Partnership Declaration,” under which at least 19 Australian Federal police agents will be inserted into the PNG police force in “advisory” and “capacity building” roles. In July, Kevin Rudd announced that another 50 AFP officers would be sent to PNG by the end of 2013. There are 9000 West Papuan refugees living in shocking camps on the Indonesian border who will not benefit at all from the deal with Australia. In fact, more than 100 asylum seekers from Papua New Guinea itself have been granted refugee status in Australia over the last three years.